It was so nice tonight at Ulpan. Morah Degani had a special night planned for us tonight to celebrate Chanukah. She called me up to light the candles for the 3rd night and recite the blessing. 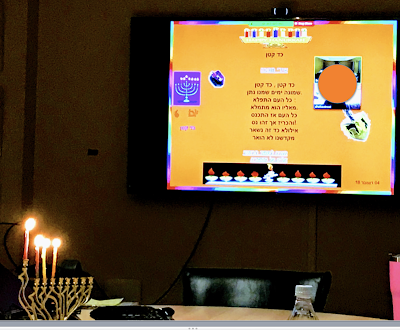 Then she played Chanukah songs and we sang along to the Hebrew words on the screen. We later read and talked about the story of Chanukah and all the meaning and significance of it for having freedom of religion/worship and to maintain our religion and not assimilate. It was a beautiful way to learn and practice our Hebrew.